"आँखे बंद कर लेने से मुसीबत का अंत नहीं होती और मुसीबत आये बिना कभी आँखे नहीं खुलती।"
"By taking off the eyes from the trouble does not end it and the eyes do not open without a trouble." 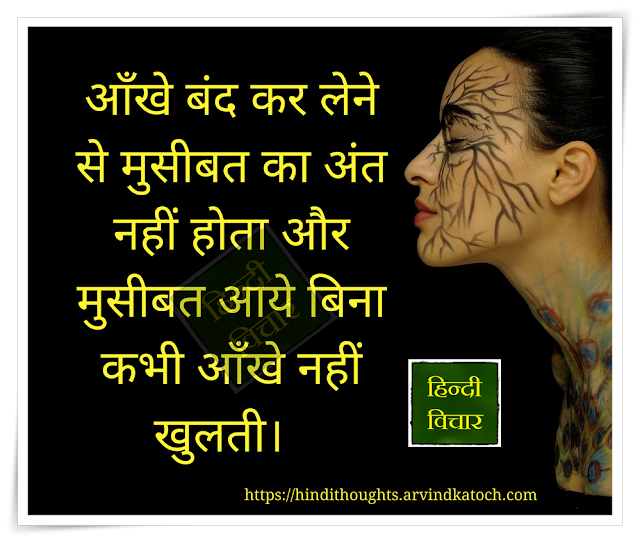 Hindi Thought Meaning- In life, we can only solve the problems and troubles when we face them and not just by ignoring them. Therefore, instead of closing eyes towards the problems one needs to face them. Moreover, problems and troubles are also important because when they come into our lives, then only we learn many new lessons and realities of life.